On the eve of Apple's education-related event in New York City, Wolfram has launched an education portal that features an interactive textbook, dynamic teaching tools and lesson plans. Wolfram announced the launch on Wednesday, directing interested teachers and students to education.wolfram.com to find a "new way to integrate technology into learning." Access to most of the site requires registration of a free account, though some samples and demonstrations are available without logging in. The Wolfram Education Portal is currently in Beta and will eventually expand to include "community features, problem generators, web-based course apps and the ability to create personalized content," the company said in a press release. "Wolfram has long been a trusted name in education, as the creators of Mathematica, Wolfram|Alpha, and the Wolfram Demonstrations Project," says Crystal Fantry, Senior Education Specialist at Wolfram. "We have created some of the most dynamic teaching and learning tools available, and the Wolfram Education Portal offers the best of all of these technologies to teachers and students in one place." Currently, the portal contains full materials for Algebra and partial materials for Calculus, with more subjects to come. Sample page from Wolfram's new interactive textbook. The company worked with the CK-12 Foundation, a nonprofit aiming to produce free and open-source K-12 materials, to develop the interactive textbook. For instance, Wolfram took an Algebra textbook from CK-12 and made it dynamic by adding its own technologies, such as Wolfram|Alpha widgets, Wolfram|Alpha links and interactive demonstrations created in its Mathematica software. The timing of Wolfram's launch is noteworthy because it comes just a day before Apple is scheduled to unveil its own educational initiatives at an industry event in New York City. The Cupertino, Calif., is widely expected to reveal a new digital textbook platform in an effort to supplant traditional textbooks with its iPad. Also of note is the fact that Apple and Wolfram recently partnered up for the feature on the iPhone 4S. The Wolfram|Alpha knowledge base plays a prominent part in providing Siri with information and saw its query volume jump 20 fold after the iPhone 4S was released. AppleInsider has heard from a person claiming to be familiar with the matter that the digital textbook project is internally code-named "Bliss" and was inspired by Apple board member Al Gore's "Our Choice" iOS e-book. The tipster also indicated earlier this week that Apple Vice President of iWork Roger Rosner has been tapped to lead the effort, a claim that was corroborated by The Wall Street Journal on Tuesday. Bloomberg reported on Wednesday that Apple Senior Vice President Eddy Cue will unveil K-12-focused software at the event, including a "set of tools that make it easier to publish interactive books and other digital educational content." The report lent support to earlier claims that Apple will announce digital textbook production software described as "Garageband for e-books." But, there is some disagreement over whether Apple will released the rumored textbook-making tool, as a separate report dismissed the rumor, claiming instead that Apple will promote new partnerships with publishers that would utilize iBooks as a distribution platform for the education industry. Apple's media event will take place on Thursday at 10 a.m. Eastern, 7 a.m. Pacific, at the Solomon R. Guggenheim Museum. Intelligent, near-human contextual conversations with school material. All the videos require flash. Nothing to see here, move along. Why not. TVs have replaced the babysitter, perhaps its time for something else to replace the teacher. This Wolfram announcement just drives it home how powerful this is going to be. Or whatever Apple have up their sleeves, I don't much care anymore. GarageBand for eBooks? Awesome. I could use that for my studies. 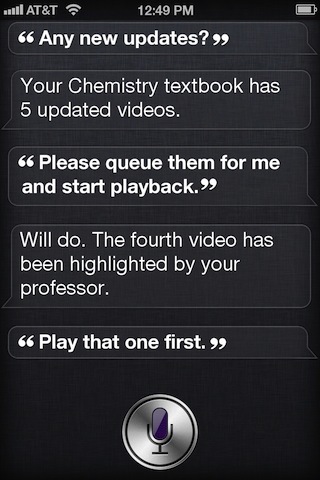 Siri + Wolfram + Education? Awesome. Anything at all? Awesome. I just came across a real neat clip from Sweden in 1985, where Steve Jobs spoke of being able to read the words of Aristotle, but not being able to ask him a question. He later said his biggest hope was that during our lifetimes, we could create a tool that would capture the worldview of a modern-day Aristotle and enable the student to ask it a question and get an answer! 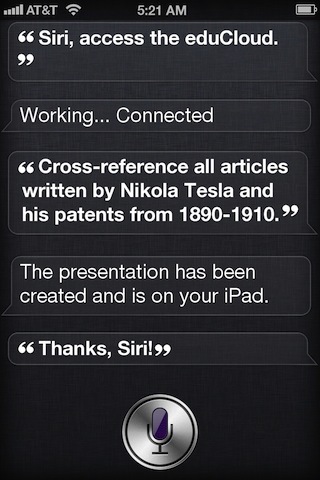 This is 1:1 what Siri could do / will be able to do. Isn't it funny how a real true vision will maintain it's power and poignancy even through decades and decades of iterations and re-iterations? The original spark is still there. I've come across 3 liveblogs for now, CNet, TheVerge, MacWorld. Are there many others? I'd like to tune on any of them. Okay, not really sure what's going on here, but it seems someone with a legitimate reply has been soft-banned by our filter. I'll repost his images (because they're relevant) and text, but maybe another mod can double-check me why it happened. I think his image URLs were just too long and they tripped the sensor, so I'll Imgur them instead. As for your question, Banned Guy, I'd bet 9to5 and Engadget would have at least text-based live updates, so check them. Wonderful! This will be great for those of us who aren't even in school but interested in a particular subject. Hopefully Apple's efforts will make a big change, and different model in higher education as well - specifically in the pricing of text books. My daughter just went back for an advanced degree and it is costing her on average about $300 per class for text books which is outrageous. The democratization of knowledge can be a powerful tool. How come Wolfram is still not acquired by Apple? Are they not for sale for any money? Aiming for IPO only? Apple could certainly afford it to put Google on its death bed. Here's hoping that Flash and crappy design are not core to Apple's strategy, because the design of the Wolfram site looks to be far more heavily influenced by the sensibilities of Microsoft than by those of Apple (i.e. for what it attempts to illustrate, it looks like ungodly colorful, badly composed, crap). How come Wolfram is still not acquired by Apple? I just hope they wouldn't be acquired by Google. That would leave bitter taste. I don't mind Apple not acquiring a company but I do mind when it leads to what happened with Bungie's Halo. Good one - thanks for putting that up. EDIT - love the conversation! Steve Jobs and Steven Wolfram seem to have had a close relationship and high mutual respect. Mathematica has been available on the Mac from the beginning. I'd imagine that Steven Wolfram desires an independent company more than riches, he wrote Mathematica after all as a vehicle for his own research and so perhaps there is an agreement between the two companies that Wolfram products will always be available on Apple products but that Wolfram remains independent. Bungie as you would be aware, was in quite a vulnerable position at the time of their purchase (rescue?). I believe that it is again independent. Man, this guy is up way too late studying. And way too excited for his next class considering how late he's been up studying. What do you people think of Apple using Wolfram's Computable Document Format for their textbook builder? I haven't had a chance to play around with it yet, but it looks intriguing. I don't know if they could make it into an open standard. This is like saying "oh I don't mind my Lakers not getting Lebron, just hope he won't be acquired by the Celtics!" Yes it's ok for sports fans to think that way, but this is not sports. It shouldn't matter whether Wolfram would be acquired by Google or not, Wolfram should be about making great products for everyone, not about Apple vs. Google. It can't be a coincidence. Steve Jobs had Steve Wolfram on stage several times at Apple events. Wolfram products are interesting, but out of reach for most. Home edition is $300, pro edition is over $1000. The demos I looked at do not compare favorably with Khan Academy videos, even if one was following along with a k12.org textbook. 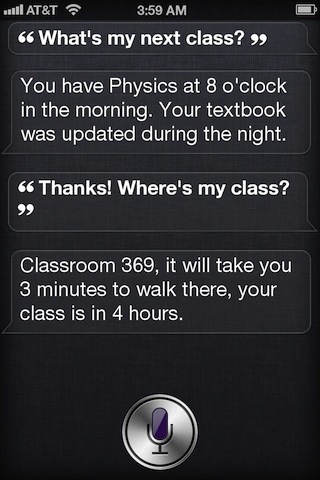 Apple may have to buy Wolfram to protect its investment in Siri, but as support for textbooks, Wolfram is not viable. Wolfram|Alpha brings most of the capability of Mathematica to focus in a browser window. Once a user is permitted to (1) enter multiple lines of code including conditionals and (2) enter even a limited data set, uses for the site will grow dramatically. For example, a classic, entry level physics experiment is that employing a pendulum to determine the local value of 'g'. Even a single line of code? and less than 1 kB of data would provide useful instruction material for even upper primary age students. It's quite an icebreaker. Not much change would be required to do the calculations (including an error analysis) on-line. In respect of Khan Academy, does the site just publish videos on a topic? I am not familiar with the site or their products but if so, there is no comparison in my opinion to the potential that Wolfram|Alpha and Mathematica promise on-line at no or little cost. I use Mathematica and cdf. Jobs said that if Wolfram wants to bring cdf to iOS, it will not be banned. On the Wolfram website, it says that iOS was always important for their cdf strategy and that cdf will come soon to iOS. I know Mathematica is expensive (luckily we have a campus licence here), but it is absolutely stunning and awesome. I can't wait for it to come to iOS, this will potentially allow fantastic interact apps with the full power of Wolfram Alpha behind. Actually my bet is that one part of the announcement today is that cdf will be released for iOS. This would be absolutely great! And a completely new way to program for iOS.